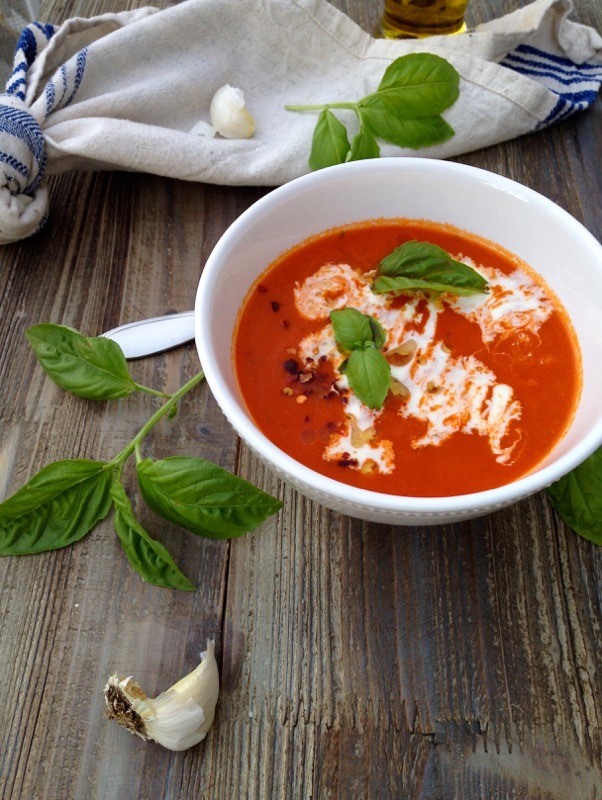 An easy, smooth and creamy San Marzano tomato soup, made with garlic, basil and sweet, flavorful imported Italian tomatoes grown in the volcanic soils in the shadow of Mount Vesuvius near Napoli. A simple vegetarian homemade soup perfect for chilly days, served together with some grilled cheese panini or bruschetta. I started with a nice sofrito, made of sweet organic onions I picked up at the farmer’s market last weekend, and some organic root vegetables. Simmered that together with my San Marzano tomatoes (<-amazon), buzzed them all up together, and finished with a touch of cream. If you want to go for a vegan version replace the heavy cream with coconut cream, or just leave it out completely. Truth is you really don’t need it. In all honesty I was just feeling a little artistic. Look: I think that’s a flying Italian stallion in my soup. TeeHehe.. Some crushed red pepper flakes for a nice kick to open up my sinuses, and tons of fragrant fresh basil made this soup simply the best! 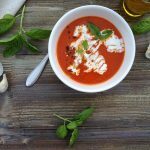 Easy and creamy San Marzano tomato soup, made with sweet and flavorful imported San Marzano tomatoes, garlic and basil. Heat up the olive oil on medium flame in a large enameled cast iron pot. Add the onion and a pinch of sea salt and saute for about 5 minutes. Add the diced carrot, celery, parsley root and bay leaf. Saute together for an additional 10 minutes until the veggies begin to soften and add the garlic. Cook one more minute. Roughly crush the tomatoes with your hand and add them to the sofrito. Give everything a good stir then add the stock. Bring to a gentle simmer and allow to cook for 30 minutes. Add the fresh basil reserving a couple of leaves for garnish. Ladle the soup into bowls and finish with a few drops of extra virgin olive oil and a drizzle of cream. Garnish with tiny basil leaves. Thank you Lana! I got a little help here and there with the technical part, also learned a lot from blog tyrant. I am enjoying the sunshine today but also trying to get some work done this weekend. Enjoy the soup, it only has a touch of cream in it but it’s optional. This looks so wonderful for a cool day! Thanks for sharing! Nice blog. I followed here from BT’s critique. I see some suggestions already implemented. 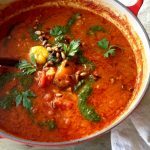 As I mentioned there, the critique (and your site) have given me some great ideas for getting my wife back into the cooking/blogging/photography game. One thing in particular I’ve been looking into … we used to think there were limited opportunities for monetizing a cooking blog. This is wrong thinking. There’s a world of opportunities out there, just have to approach with an open mind. Godspeed. Thank you Dave! 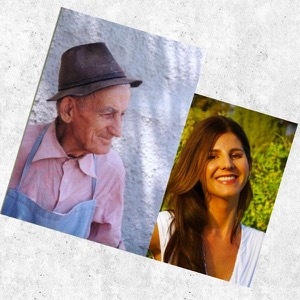 What is your wife’s cooking blog ? I’d love to check it out. I am still learning about monetizing my blog too so I am open to ideas and suggestions. Thank you for the terrific soup idea. This looks fresh and easy to make. 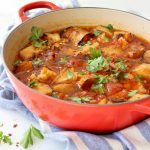 Your latin stew looks delicious, I will give it a try one of these days. I need to stop coming over here, I’m always hungry after seeing your recipes!! :o) …and I’m not even a soup fan!! Now I want some!! One day soon my friend! Peace and Love to you and all this delicious food!!!! Sounds delicious!! 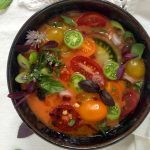 I am definitely going to try to make this soup! Thanks Luda! Enjoy the soup, and enjoy making it! 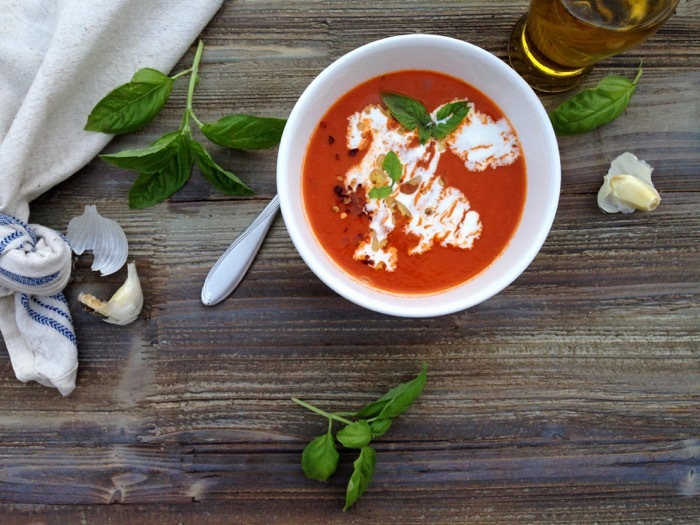 Tomato soup is one of my favorite comfort foods. And made with San Marzano Tomatoes just elevates the flavor. Thanks for sharing this recipe for us. 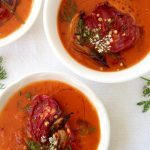 I made my first tomato soup recently and am looking forward to trying this new recipe. This recipe came up in a Google search this evening when I searched for a tomato soup recipe with ingredients I had on hand, but with only a small amount of cream. It’s fantastic!!! I’m heading to the kitchen for a second bowl!!! I’ll be back to see what other deliciousness your blog has in store!